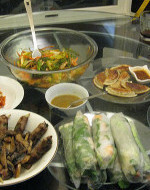 There are many types of Asian foods and recipes from all around Asia. In the Southeast part of Asia such as Thailand or Cambodia curry is a very important ingredient to their foods and recipes. In Northeast Asia in countries such as Japan, Korea, and China the recipes call for special sauces, rice, and some spices to flavor their foods and recipes. In China there are many regional cuisines such as Cantonese, Szechuan, Hunan, and Beijing style cooking. In Southeast Asia in countries such as Thailand, Cambodia, Laos, and Vietnam people enjoy local recipes that use lots of Garlic, Basil, Hot Peppers, Lime and Cilantro. Indian food is a very interesting Cuisine with its many flavors, spices, and curry’s. Cooking techniques of Asia range from stir- frying, steaming, and deep frying recipes. Stir-frying is a very important method of cooking many types of Asian recipes. Stir-frying is done in a Wok and which is heated to a high temperature. When stir frying an Asian recipe it allows Meats to stay tender and Vegetables to be cooked quickly to sear in flavor. The wok is most commonly associated with Asian recipes because it is the common vessel to cook foods Using a Wok for stir frying foods is important method for most Asian recipes because of its design. A wok can be used for stir-frying, but can also be the base to deep-fry, braise, steam, and grill many types of food. Researchers have found that the more Fish people eat the less coronary artery disease they may develop. Asians eat a lot more fish than Americans. Fish contains omega-3 polyunsaturated fat that is great at lowering cholesterol. Also Asians eat in general more Soy products such as Tofu, and textured soy protein Garlic is a main stay in Asian cooking studies show that eating 1000 mg can reduce lower cholesterol by 10-12%. For Asain Dinks Green Tea is King and is said to wash bad fats out of the body.